Faced with having to give up her treasured family home of 21 years, a Cotswolds pensioner has come up with a thoroughly Green-and original-solution to the financial burden of running it, and has nearly halved her power bills. Christine Shine now owns and manages her own Ofgem-accredited renewable electricity plant, which powers not only her home, but others in the area. The power station comprises a series of 390 photovoltaic panels, which cover an area roughly the size of two tennis courts and are concealed in the grounds of Mrs Shine’s Gloucestershire home. The construction sits only 60ft from the 19th-century manor house, but is discreetly hidden by a raised bank and housed in a purpose-built pit. 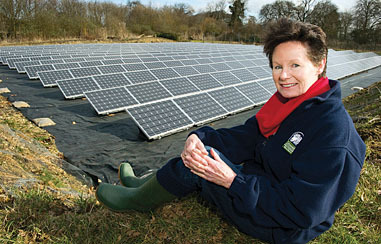 Using only daylight to generate renewable electricity, the panels produce enough power on even the shortest, greyest days to allow Mrs Shine to sell her surplus to Green Energy UK, which in turn puts it back into the National Grid. This will earn her about £12,000 after tax each year. In addition, Mrs Shine has insulated the entire seven-bedroom house with locally sourced wool and given it a coating of insulating paint, as well as installing special transparent blinds that eliminate draughts and retain heat. Even the swimming pool has turned eco-friendly, having been fitted with a geothermal heat pump, which will warm the water using the only the core heat from the Earth.